Through Nature NB, the first two of three planned province-wide surveys for Barrow’s Goldeneyes have been completed. The third and final survey is scheduled for March 27-31. Information on helping with this future count is below. The surveys, undertaken with volunteers, are an effort to determine how many Barrow’s Goldeneyes over-winter along the coasts of New Brunswick. The surveys are also being done to determine how the population moves about during the winter, likely due to ice cover pushing them further south as winter progresses. These birds can show up anywhere along the coast of New Brunswick or in sewage lagoons, often with Common Goldeneyes in areas where there are few Barrow’s. Results from the first survey this winter have mostly been taken from the province’s Christmas Bird Counts (CBCs) and are summarized on the map. Results are preliminary, as the full CBC data is not yet available. 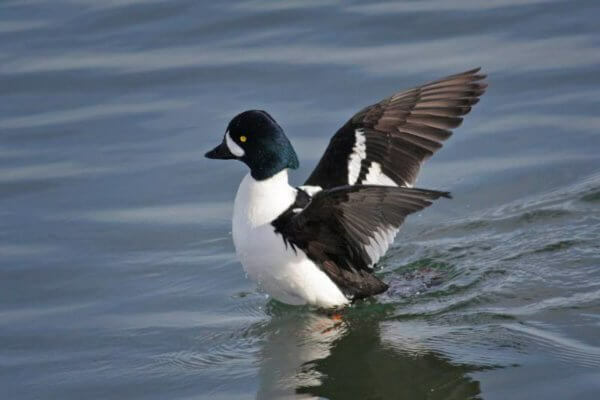 The data for Barrow’s Goldeneyes found along the Bay of Fundy includes data after January 4, as only two Barrow’s were seen on that coastline during the survey period. It appears that Barrow’s started to move into the Bay of Fundy after the start of the year. 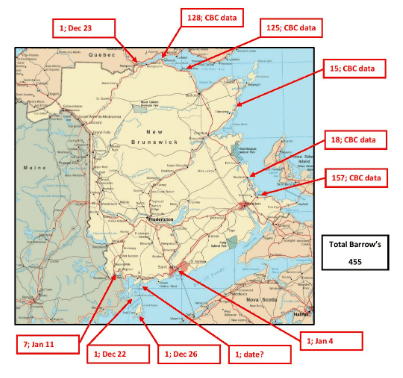 To participate in the Barrow’s surveys, please contact Nature NB at [email protected]/ (506) 459-4209, so that we can obtain as much coverage as possible and also avoid double-counting. Then just go out during the count period and see what Barrow’s you can find. Take note of the date, location, number of Barrow’s in each location and, if possible, whether they are male or female. What is the Barrow’s Goldeneye? The Barrow’s Goldeneye is a species of sea duck closely related to the Common Goldeneye and the Bufflehead. The Barrow’s is different though, as it is split into three populations that do not interact. The Pacific population represents about 85% of the total and a non-migratory population of about 2000 birds stays in Iceland. The Eastern Canada population is likely less than 7,000 birds. The eastern Barrow’s overwinter in the Gulf of St Lawrence, along the northern and eastern shores of New Brunswick and along the coast of PEI. There are always a few individuals who go further south to the Bay of Fundy coastline or into Maine or Massachusetts. In their wintering grounds is where pairs form (or reconnect from the previous season) prior to the summer breeding season in eastern Quebec and Labrador.